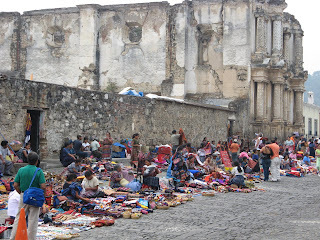 Guatemala is a fantastic country, colorful and culturally fascinating. We returned from our US visit/family reunion and found our boat in fine shape. Since it was closed down for our travels, we made the snap decision to leave after just one night aboard even though we were exhausted from our late arrival. It just wasn’t worth restarting the boat systems to live aboard for a couple days only to leave again. Our trip to Guatemala was full of travel incongruities. We left our marina in the shotgun protected, luxury, air-conditioned van with a bunch of our fellow boaters out on their provision run to Usulutan. From there we took the local bus (loud, hot, crowded, stops everywhere) to San Salvador. We elected to just crash overnight in San Salvador at our now familiar $18 hotel (with AC!) that is conveniently located a half block from the bus station for Guatemala. San Salvador has at least 5 bus stations, 3 of which we became familiar with depending on our destination. We walked around the Centro of San Salvador and the blocks of permanent street market where nearly everything can be bought. It is loud, crowded and fascinating and reportedly not a safe place at night. Our luxury bus to Guatemala City left at 6 AM and it was our favorite bus. The bus itself is new and, on our return trip even had leather seats. The attendant brings blankets and pillows shortly after take-off to ease your rest in the seats that recline almost completely with back of the leg rests. Breakfast was served during the first of the 2 movies that could be listened to (or not—an important distinction from later buses) on individual headphones. Too bad the trip only lasted 4 hours! We were torn between the movies (both romantic comedies instead of the usual beat ‘em up, shoot ‘em up stuff we found in Mexico) and the scenery unfolding before us. 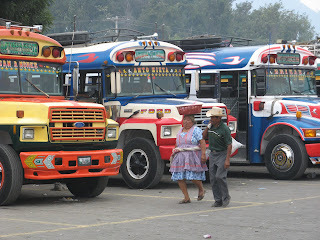 The border to Guatemala was a breeze as the bus line had already searched our bags and we had already exchanged money. They looked at our passports leaving El Salvador and then again entering Guatemala, both times from the comfort of our seats and we reclined and dozed to the tune of the money changers crawling around the bus with handfuls of money screaming “Cambio, cambio” (change). All this for $28 each. Literally as we crossed the border to Guatemala, the scenery seemed greener. We had heard and also found that there was less garbage on the roads. Guatemala City which we only saw from the vantage of a taxi was modern and busy with interesting architecture. We chose not to spend time there but were torn by that decision in retrospect. Still we headed to the local bus to Antigua as it was just 11:00 AM; these buses are known to all as “chicken buses” famous for their avian cargo along with the human kind. Although we saw no chickens on the bus, we certainly saw fruit and veggie baskets, various bound-for-market goods. Our hosts in Antigua said they had guests who referred to the buses as “las latas de sardines” (cans of sardines) which is apt as these former schoolbuses are never full. You can always fit more on. The seats made for 2 and 2 usually held 3 and 3 with the center 2 people filling the aisles and propping each other up and then the rest of the people standing in the remaining space in the aisle. Somehow the bus assistant manages to walk the aisle (what aisle?) and collect the money and remember who already paid. The assistant usually hangs out the back door yelling the destination for potential riders, then bangs on the bus or whistles or yells when it is clear to take off jumping on the moving bus at the last minute. We saw buses in the morning rush hour with at least 3 young guys hanging on the outside of each door they were so full. On the old school buses, the exit is from the front or the back door “emergency exit”. I always wanted to get off the school bus by the back door and I finally got my chance in Guatemala! We arrived in Antigua dazed and disoriented and unsure of where to stay. We had a vague idea that we wanted to do a week of Spanish school, but, as there are more than 50 schools there, we weren’t sure where to start. We thought we would find a hotel but couldn’t even figure out what street we emerged on when we were found by one of the compelling salesmen of Central America. This guy had various brochures and started to suggest a hotel (for $85—way out of our league) then somehow we mentioned Spanish school and, hey, what a coincidence, he represented one of them too and it was nearby and they could place us with a family right now in time for lunch if we wanted and we thought about being comparison shoppers and finding our own school and/or hotel, looked at his earnest face, shrugged and followed him to the school. The price was about what we expected ($150 each for a week with 4 hrs/day individual instruction, family home stay and 3 meals/day for 7 days) so we signed up. Alas, we missed lunch with the family but were taken right there to settle in. Our family was a lovely bunch of people. Their home was behind the family printing business on the street and consisted of at least 6 bedrooms on 2 floors. There was one other student in the home, a young man from Iceland who had been with the family 5 weeks. The family consisted of the mom (Carolina) and her husband, 4 of 5 of their children, the youngest of whom was 15 and the 5th child and her husband came for 1 or more meals of the day with their daughter age 5 who was outgoing and hilarious. Oh and lets not forget the pregnant cat and 2 terriers (“married” said Carolina) who sometimes got spooked at night and barked for a while. Meals were attended by up to 9 people altogether. All talk in the home was in Spanish although I’m pretty sure our hosts knew some English. It was a marvelous experience as they were warm and welcoming, especially Carolina. When she learned I was a doctor, she asked for information on some rare genetic diseases for a talk she was giving at her church and I used that as a homework assignment to write up something in Spanish for her. Her speech in particular was purposely clear, slow and simple for us, her student renters, and, by the end of the week, I was able to go for an hour walk with her and understand 95% of the conversation. There were a few inconveniences to deal with. Showers in Guatemala often have on-demand water heaters right in the shower head. In the less well-made ones, wires just stick out of the head (note to self: don’t touch the showerhead! ), in others they are built in and less visible. This results in just one faucet for hot or cold water—turn it slightly and it is mostly hot, turn it more and more cold is mixed in. We wish we knew this important information right away but it took a few days of experimentation to get to a hottish shower with adequate water pressure. The house didn’t have any windows as it was located between 2 buildings and the front was a storefront. The ceiling of part of the second story was open air, but covered with an umbrella for rain. The floors were cement in the hallway and never could get clean and because (I learned in class) electricity is very expensive in Guatemala, there never was very much light to study by in the house. So we spent the week fighting over Richard’s stronger reading glasses, squinting at the impossibly small type in the Spanish dictionary, putting on shoes to walk anywhere so our feet didn’t come back black, figuring out the shower and living without ambient light indoors. To balance it out, the family was warm and welcoming, the food was pretty good, Maria Jose the 5 year old grandchild was adorable. With my medical background, it often happens that I learn more about people than I set out to and this was no exception. I’m not sure how many other students found out about the son-in-law’s seizure disorder, Carolina’s diabetes and liver problems, etc. Still, it’s a good door opener. The school was in a courtyard and the students were from around the world—Denmark, England, Japan, Korea, Iceland, the US, Canada to name a few we knew of. We were by far the oldest students there. We would sit with our instructor either in the classroom or around the porch of the courtyard and work intensely all morning. My teacher, Veronica, spoke little to no English and my whole class was conducted in Spanish. She covered points of grammar, vocabulary, conversation, we read stories (often nautical ones she picked out when she learned of our lifestyle) and, at my request, some terms and expressions that would help in medical interactions in Spanish. Richard, who knew very little Spanish at the beginning of the week, picked up an enormous amount of info on grammar, conversation and vocabulary from his instructor who did speak English part of the time to make it easier for him. She also took him to the market one day to help her with an errand and so he could observe her bartering with the merchants. Overall we both felt like the week was incredible. Layer on top of that the magical beauty of the city of Antigua which we explored every afternoon and the result is bliss. We loved our week there. We arrived on a Satuday and didn’t start school until Monday so, on Sunday, we booked an outing to a local active volcano, Volcan Pacaya (for $7 each). They drove 10 of us an hour and a half each way then left us with a guide to walk us up the volcano from a village on the slope. They had a geothermal plant near the village and the volcano has been actively spewing lava for 7 years after a devastating eruption. The first part of the walk was through forest on a well tread path and our guide gave us information about local trees and about the volcano (in Spanish). Then we climbed over an old lava flow (9 months old) up to where the lava is currently flowing. Lava is very rough stone, hard to walk on and very irregular in surface, a challenge for our boat sandals, the only shoes we had thought to bring in our packing rush. Still, we got close to the lava, within 30 feet of red-hot lava still flowing down the hillside. The guide picked up some wood along the trail and showed us how hot the white spots between the rocks were by starting an immediate fire upon throwing the wood in. Don’t fall in those spots! In fact, we both thought this tour wouldn’t meet the “safe enough not to be sued too often” benchmark for US guided tours by a long shot!! It was a phenomenal experience. The group we traveled with included people from the US, New Zealand, France, Switzerland and England. One of the English guys had his cell phone ring on the mountain and received a call from his brother in Japan—what a global world it is! Antigua is a gem of a city, a colonial Spanish city built in the 1600’s and capital of Guatemala until a devastating earthquake in 1773. The building style is lovely colonial with churches and monasteries in abundance throughout the city, some of them in picturesque ruins, others gloriously restored. The central square is park-like with beautiful plantings and a lovely fountain and is used extensively by the townspeople day and night. The climate is “eternal spring” with warm days and cool nights although it was just before the rainy season for us so the usual beautiful blue skies were cloudy much of our week. The city is in a valley between volcanoes over 10,000 feet elevation, one active (different from the one we climbed), a remarkably picuresque setting. There were museums, galleries, artisan markets, all kinds of shops (including one of homemade chocolate which naturally we checked out) and we explored it all. The largest monastery in town has been converted to a stunning hotel/park/museum complex—Hotel Santo Domingo. It is a unique blend of ancient ruins, maintained and being restored, and a 5 star hotel and convention center. We strolled the grounds (parrots on perches throughout), walked through the 5 museums and admired how the residences were put in restored building but maintained the flavor of the monastery with its several foot thick walls. Nearly every day the school sponsored an outing. One day we went to a local coffee farm where they had a museum describing all the steps in coffee production. On the grounds were also a music museum, developed to help maintain the traditional Mayan musical instruments and knowledge of its music, and a museum of Mayan clothing and crafts. The guides spoke very slow, clear Spanish in deference to the many Spanish students in town—no tours in English--but, by then, we understood the tour. It was a fascinating afternoon, well worth the time. The city is toured by people from all over the world and we enjoyed the fact that most Guatemaltecans asked where we were from, didn’t assume we were Americans as had always previously been the case. Guatemala is one of the largest producers of coffee in the world, but, ironically, the excellent roast coffee beans are almost all exported so finding a good cup of coffee is a challenge and expensive (especially for the locals). Nescafe is the coffee served most universally as sad as that is. Also sad is the fact that less than 10% of the profits from the lucrative coffee business make their way back to the original farms and the workers doing the backbreaking labor.